Calendula officinalis, the common marigold, is a bright and beautiful flower that offers medicinal, culinary and visual delight. In honor of summer and in hopes of it staying in the Northwest, calendula is an excellent plant to present as it is great for healing cuts, scrapes, bruises and bug bites; all part of summer time enjoyment. As well, with the warmer temperatures and blooming flowers we can add the petals to our salads. Calendula is used topically as an antiseptic and therefore helps prevent wounds from becoming infected. It promotes draining of the wounds (keeps it clean by flushing out the microbes) and stimulates the surrounding lymph nodes to work extra hard at fighting off any intruders. It also soothes the wound helping take away the pain and discomfort. Calendula applied to bug bites can help with the itching or the aftermath of excessive scratching. flowers can be used for teas, tinctures, compresses or salves. 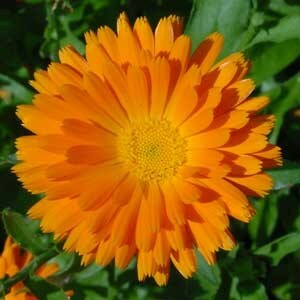 Many natural health food stores sell calendula ointment, a superb and often needed addition to your medicine cabinet. If you happen to have dried calendula flowers when winter seeps back into the Northwest, make tea with the dried flowers and drink throughout the wet damp months. It is a wonderful support for your immune system by removing stagnation and congestion. Calendula is a gentle and safe plant that can be used and enjoyed throughout the year. For further information on Calendula and the different ways to prepare it stop in for a visit or chat with your local herbalist.